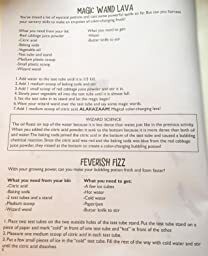 I figured this was going to be a lot of “add vinegar to baking soda and watch the magic happen!” And though, yes, baking soda and vinegar play major roles in this set, there is definitely other fun stuff happening in the kit, too. I’ve attached pictures of a few of the experiment directions, so you can see some of the things you can do. Even though most of the experiments call for basic household ingredients, packaging goes a long way here. The kit comes with everything you need, and all of it comes in cute little pouches or bottles. You also get four big test tubes with a stand, two mini scoopers, and a plastic wand. 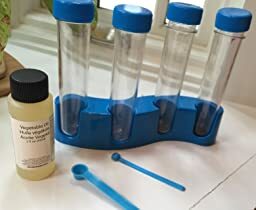 I know it sounds crazy, but the scoopers and tubes genuinely make these common cooking ingredients feel more like legit “experiment components.” Seriously, the presentation of this kit is perfect. My kids are excited to do each experiment (we’ve only done about half of them so far). I think making the crystals for the inside of the plastic wand has been their favorite, even though it required A LOT of wait time. But the kids are genuinely excited to see what will happen when we add this to that or drop in this color tablet after the last color tablet. They are engaged and excited (and occupied). Honestly, this set pretty much blew my expectations out of the water. It’s been a real hit. 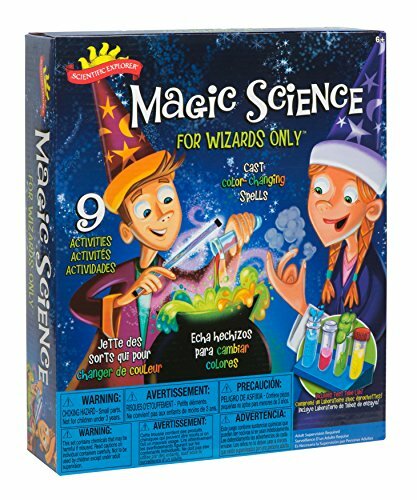 This kit is what you make of it and I would not recommend it for kids over the age of 6 or 7 unless they are REALLY into science and mixing things. 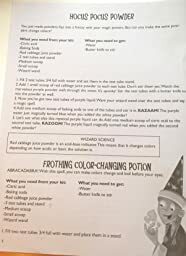 My daughter(8 years old-3rd grade) was able to predict every color the “potion” was going to change, so it was a bit underwhelming for her. The Fizzy Frenzy experiment only fizzes for about 10 seconds, so that experiment is over pretty quick. The wizard hat is really cheap. 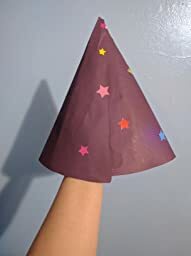 You basically just cut out a purple hat from paper that is only slightly stronger than normal computer paper. One experiment she has been showing off since doing the kit is the magic wand. 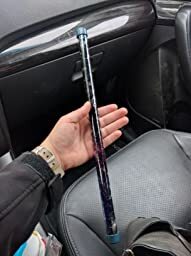 You place these little crystals into the wand, add water, then an hour later they have filled the entire wand with nice big crystals. 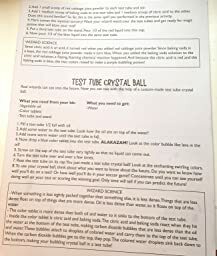 The Magic Lava experiment consisted of combining vegetable oil, citric acid, baking soda and red cabbage coloring inside one of the test tubes and you could watch the oil and the coloring going in circles inside the tube. 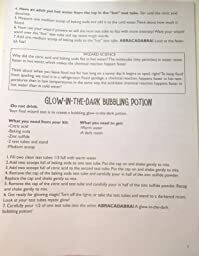 The Glow in the Dark experiment combined zinc, baking soda and citric acid and the zinc made it glow, which was cool. This kit could be much better suited to Kindergartener age children or perhaps a kit that a slightly older child could do completely on their own. This kit is truly what you make of it, some kids are gong to think its amazing while others are going to be underwhelmed. 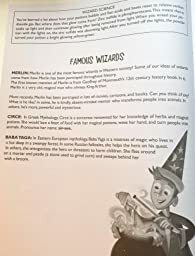 Our son got this for Christmas two years ago at age 8. He needed supervision and some encouragement to stick with directions. He is now ten, still enjoys using what is left of it, and still needs supervision. Due to the simplicity of the components, many of the consumables are easily replaced with household items (i.e. baking soda). He went through the experiments over the course of a few months. A couple of times he snuck to get the kit and do unsupervised experiments, which resulted in a huge mess, but no permanent damage. I didn’t really find this to be very educational, although the explanations on the experiment cards try to incorporate science. Kids are just interested in the blowing things up and changing colors parts. However, our son has gotten more use out of it than any science kit he has received. The sturdy plastic parts have lasted, although the wand and the wizard hat are long gone. It may be cheaper to buy at Michael’s or JoAnn’s with a coupon, but overall, even here I felt it was a good buy and a fun kit to come back to over time.